Trying to understand the rules of poker can be confusing, largely due to the many different variants of poker games and the confusingly similar but misleading information on the Internet. Here we are going to simplify poker rules and explain to you the basic rules and how they vary across different formats of poker games. There are literally hundreds of variants of poker games, most of them are hardly played and the list can probably be cut down to less than 10 games that are regularly played today, the most common being Texas Holdem Poker. Holdem Poker Games – these games share cards between players, so a number of common cards (called community cards) are dealt in the middle of the table which are available for all players to use as part of their hand. Stud Poker Games – some cards are dealt to players “face up” which means all the other players can see them and others are dealt “face down” which means only the player can see them. There are no shared or “community” cards. Draw Poker – each player is dealt a number of cards which only they can see, then throughout the hand they have the opportunity to swap cards for new cards to try and make a winning hand. Obviously there are different variants of poker games because they all have different rules so it is impossible to comprehensively cover everything in this article. So….. below you will find the basic poker rules and concepts that apply to most poker games. Read and digest these and then, after you have decided which poker game you want to learn to play you can head over to our Poker Games & Rules section to get a more detailed guide for the game you have chosen. Poker games are played with a “deck” of 52 cards. Each deck contains four “suits” – hearts, spades, clubs and diamonds. Each suit contains 13 cards, the numbers 2 to 10 and then four “picture cards” Jack, Queen, King and Ace. The Ace, depending on the game, might be counted as the lowest or highest card. Cards are dealt to each player depending on the rules of the individual game you are playing. After the cards are dealt there will be a series of betting rounds where each player in turn is given a choice of the following options. Check – you do not wish to bet any chips at the moment and you take the “free” option – this is only an option if someone hasn’t already placed a bet before your turn which removes the free option of checking. Bet – You make a bet by selecting an amount of money or “chips” and clicking on bet if you are playing online poker or pushing them towards the middle of the table if you are playing live poker. The bet must be between the minimum and maximum limits in force which we’ll discuss later. Once you have bet then other players must match that bet or they are eliminated from the hand. Call – If a player has already placed a bet and you wish to stay in the hand then you must match that bet, you are said to be “calling the bet” or as you would announce “I call”. Raise – If a player has already placed a bet then you have the option to place a bigger bet, this is called a “Raise”. 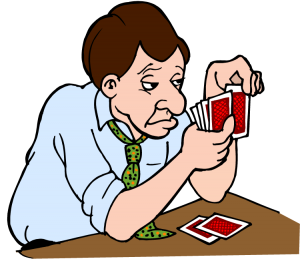 Fold – If a bet has been made and you don’t want to match that bet then you “fold” your hand. Folding your hand eliminates you from the hand. Each betting round is complete when all players have either called the highest bet, or folded their hands leaving only one active player (the player who made the highest bet) – then the next cards are dealt and another betting round may start. There are two ways to win a hand of Poker. You make a bet and everybody else folds their hand leaving you the only player left in the hand. How a Hand is made up? Hole Cards – these are cards which are dealt to an individual player – they are only available to use in the hand by the player they are dealt to. Community Cards – these are shared cards dealt in the middle of the table and are available for all players to use in their hands. Depending on the rules of the individual game you are playing, Cards are either dealt “face up” so everyone can see them or “face down” so only the player who they have been dealt to can see them. How a hand is made up will vary depending on which poker game you are playing, but to give you an idea lets look at an example from the most popular form of Poker – Texas Holdem Poker. In Texas Holdem each player is dealt two “Hole” cards – these cards are dealt face down and only the player knows what the cards are. Here are the hole cards we have been dealt. During the course of the hand a total of 5 community cards are dealt “face up” for everyone to see in the middle of the table. These community cards are shared and available for all players to use in their hands. So there are now a total of 7 cards available to us and we take the best 5 card hand from those 7 cards. The above is a very good introduction to the basic rules of poker and hopefully cuts through some of the confusion on the subject that a normal google search can produce. Now you have a basic understanding of poker rules you should continue to look through the other articles in the Poker for Beginners section to continue to get a good introduction to poker.Once you have done that then it will be time to choose a game to learn by heading over to our Poker Games & Rules section – most people start out with Texas Holdem as this is the most widely played, but its up to you.